Which Volkswagen SUV Are You? If you had to be a new Volkswagen SUV, which one would you be? Take our quiz to find out! 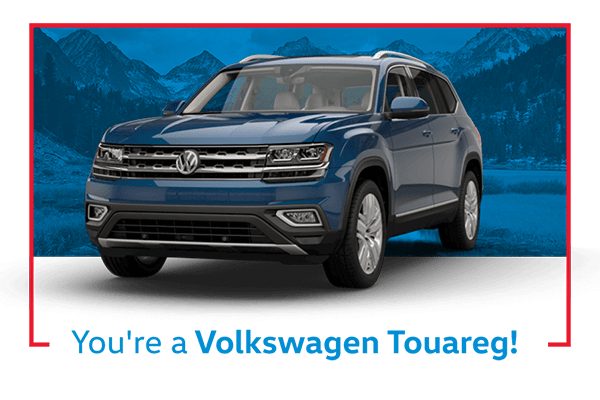 Simply answer the questions below to determine whether the Touareg, Tiguan, or Volkswagen Atlas SUV most closely resembles your personality and Wesley Chapel driving needs. Add up the points to discover your SUV counterpart, and then make your way over to Reeves Volkswagen to see your match in person. 1.) Are You a Big Spender? I care about quality, but I also like to keep to a budget. I’m willing to spend more if it means I can access more features and conveniences. I want the best of the best! I like to experience the latest in-car technology and fun add-ons. 2.) How Much Space Do You Take Up? I don’t need a ton of space, just enough for me and a few friends to stretch out and feel comfortable in. Of course, I want to have space for my stuff too! I like to stretch out, and it would be nice to have the extra space for everyday errands as well as weekend adventures. I want PLENTY of space – I often go on trips with friends and family and need to accommodate for that. 3.) What’s Most Important to You? Safety, entertainment, and space are at the top of my list. I want to be able to bring all of my friends and family along for the ride while keeping them happy and safe! I see myself as both versatile and practical. Urban or rural, I want to make sure that I have all the tools I need to get the job done whatever it may be without breaking the bank. I want the latest and greatest, the best there is. I keep up with modern technology trends, and I like to know that there is always room for improvement. 4.) Finally, How Luxurious Is Your Lifestyle? I like to be comfortable. A few really nice things here and there are great! I want to make sure I’m getting the comfort and luxury I deserve. I want the best luxury I can find, and I’m willing to pay for it! If you have 4-6 points, you’re a Volkswagen Tiguan! Starting at $24,595, this new Volkswagen SUV is affordable, accessible, and practical. Just like you, the Tiguan is versatile as well, coming in 9 different trim levels and offering both 5 and 7 seat options. Thanks to 4MOTION® all-wheel drive, you can go anywhere, anytime, making it a perfect match for your adventurous personality. 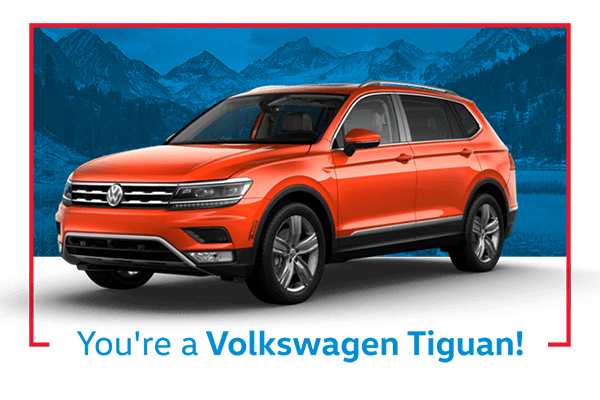 The Volkswagen Tiguan SUV’s 2.0L TSI® engine provides 184 horsepower and 221 lb-ft of torque and offers an EPA-estimated 27 MPG on the highway. Whether you’re driving around Clearwater or taking your adventure on the road, the Volkswagen Tiguan performance features help you get where you want when you want. If you have 7-9 points, you’re a Volkswagen Atlas! 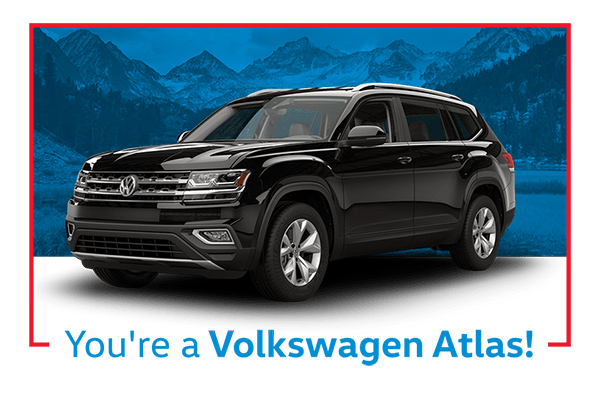 The family-friendly SUV for the family driver, the Volkswagen Atlas has the space, safety, and entertainment features that matter most to you. This Volkswagen 7-passenger SUV has enough space for everyone. Need more space? Fold down the second and third rows for a maximum cargo capacity of 96.8 cubic feet! Entertain kids and adults alike with SiriusXM® Satellite Radio, amplified by the 480-watt Fender Premium Audio System. Priority number one is safety, and the Atlas delivers with a 5-Star Safety Rating from the National Highway Traffic Safety Administration*. Check out the Volkswagen 3 row SUV that matches your personality and needs at Reeves Volkswagen. If you have 10-12 points, you’re a Volkswagen Touareg! You enjoy luxury and are willing to pay for it, which is why you’re a Volkswagen Touareg SUV. This 5 passenger SUV is a high-end luxury SUV, fully equipped with the finer touches. Take advantage of an 8-inch touchscreen navigation with 3D landmarks, or kick back and listen to the available 620-watt, 10-speaker Dynaudio premium sound system. Enjoy heated seats, Vienna upholstery, and a Panoramic Sunroof. 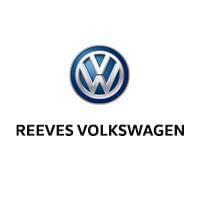 Now that you know which Volkswagen SUV you are, learn the benefits of owning an SUV come see your match in person at Reeves Volkswagen! Contact us with any questions you may have, and check out how you can save by leasing a new Volkswagen! *Government 5-Star Safety Ratings are part of the National Highway Traffic Safety Administration’s (NHTSA) New Car Assessment Program.